In Þingvellir, Iceland, where the North American and European tectonic plates drift apart, Björk and author and philosopher Oddný Eir are discussing rifts of the human kind. There is a thick layer of snow outside the singer’s house, but inside there is warmth and laughter. The pair started working together in 2008, as the Icelandic financial crisis took root. They encouraged local people to form their own ‘green’ startup companies as an alternative to the country’s massive aluminium factories, fighting for a wider range of technological alternatives that could coexist in harmony with nature. They’ve shared a bond ever since, although this is the first time their conversation has been recorded or translated into English. In the conversation that follows, the pair discuss heartbreak, transformation, romantic relationships and devotion, themes that reverberate intensely through Vulnicura, Björk’s majestic follow-up to Biophilia (2011). The record, which features music produced in collaboration with Arca and The Haxan Cloak, was unveiled on iTunes in January after it leaked online. A physical release will follow on March 9 to coincide with Björk’s live shows at Carnegie Hall and massive MoMA retrospective, which brings together specially commissioned new material alongside insights into her career of innovation. Björk: I was really curious, after you heard my new album for the first time last night, how you felt its themes might mirror your new book? Oddný Eir: Similar desires and challenges appear in your lyrics and in my book, for sure. It has a lot to do with trust. Devotion and trust. I really felt my last three books were nurtured by our discussions over the years. Because we haven’t just been chatting about boys – well, that as well (laughs) – but we started at the moment of the financial crisis in Iceland and somehow I feel like we were in a personal crisis, as well. We were dealing with our relationships and we really wanted to make things right. 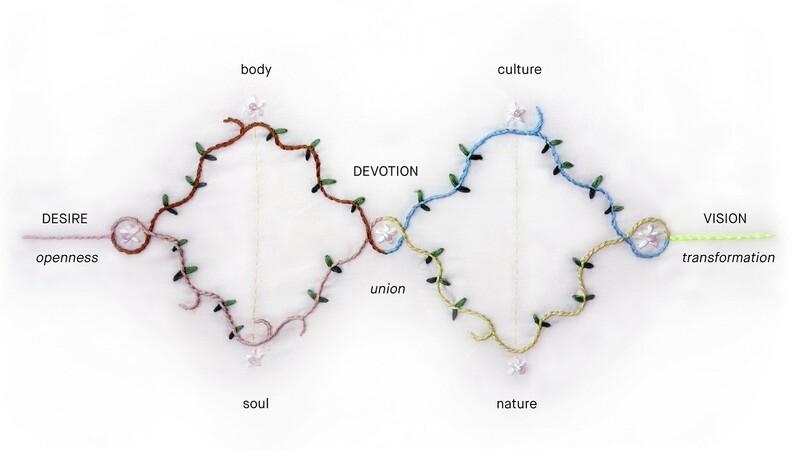 So I made a diagram (see below), just for fun, to visualise some of these dualities and the urge to overcome them. Björk: I think this is an amazing map. To me it’s about the relationship of two people, but there are different entry points too. When I make an album, I start with desire, intuition… and then for me often the beats represent the body, and the soul is found more in the strings and the vocals. This new album, for example, is more traditional. It’s a ‘singer-songwriter’ kind of album, with beats and strings and heartbreak lyrics. (laughs) If Biophilia was Star Wars, then this album is like an Ingmar Bergman film or something; black-and-white with some violins and some angst and psychology. I was rolling my eyes like a difficult teenager when I realised it – like, ‘DAMN, I’M GOING TO HAVE TO GET THE VIOLINS OUT AGAIN!’ So it’s almost classic, you know, so typical. But you have to just go with it and try to do it in a 21st century way which is truthful to you. Because you can’t ignore that. It’s part of your emotional chronology, so you have to address it and move on to the next thing. Oddný Eir: People are often afraid of conflict, because they think it will just block or break them instead of leading to something further. The miraculous thing is when both of you are looking at the relationship as a way to transform; to fine-tune what’s beautiful in each other’s souls. 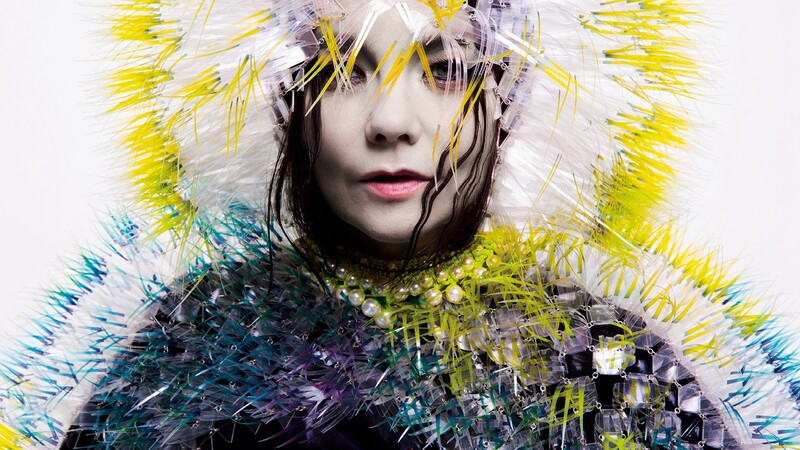 Björk: I’m so grateful when my friends or collaborators give me something to push against. Maybe you don’t agree with it, but it gives you something to ricochet off. It opens an exit route. It’s not about getting stuck on what’s wrong, but encouraging each other to go to a new place, where it can grow. I feel that the collaborations I’ve been most happy with in the past have tapped into that energy. Both partners experience it as equals – they were as generous as each other and got as much in return. And you’re not even counting. You give very different things, because you are very different, but somehow it’s still fertile and you both grow. And if you’re lucky, you can find where your mutual resistance point is, and you rub against it. Then you will be able to transform each other and show each other pathways you couldn’t see before. Björk: I actually think I’m very guided by that feeling of ecstasy when a ‘merging’ happens – I’m always trying to find that spot, over and over again. I think this is probably my strength and my weakness, because most times it needs insistence to even happen. When you walk up a mountain, you don’t feel good till you get to the top. That’s when you get the ‘bliss’ moment. In both love and work relationships, it is sometimes the women – I mean not only women, but the ‘feminine’ in people – that expect some sort of transformation in a relationship. You show each other what you can become. And you only feel that the relationship has been successful if there has been some sort of transformation. In a way this is a feminine quality, but sometimes it gets a bad reputation, because it gets turned into, ‘Oh, women, they always wanna change their man.’ And for sure, when it’s a dogmatic, negative thing, it’s obviously terrible. But if it’s done well and is liberating for everyone, then it can be a miracle. I think if we were left alone on a desert island we would lose a lot of transformational opportunities that only collaborators or friends, lovers or even families can give to us. Oddný Eir: This is also what I was writing about in my new book: about the possibilities, not only of women in general, but of women getting older. There’s this prejudice in our culture that the older woman is without sexual power, as she has sacrificed it. And that prejudice extends to how women’s voices are perceived in art. Oddný Eir: Yes, there is this kind of hypocrisy in our culture. We want women to be full of emotions but then we can’t handle it. Oddný Eir: Oh yes, like you’ve failed if you don’t do it and you’re second-class if you do? (both laugh) So you have to do it all in a different way? Björk: I made all these albums which are maybe not ‘narrative’ in a traditional way; they’re more about the music. And I hear people that go, ‘Aww,she can’t write narrative,’ as if everything else is second-class music. I was playing my new album to people recently and they were like, ‘Oh! Björk is back on form!’ and I just wanted to stick my tongue out because it was this idea that you had to tear your heart out and just ‘doof!’ it on the table, like that’s the only way for a woman in music to be first-class. Oddný Eir: Yeah, to say you are either completely technical and detached from emotions or you are the songwriter of the narrative, it’s missing the point. I find this confusion also in literature. You told me how you feel there is this ‘emotional chronology’ once and, my god, how I liked that term. But this chronology is often hidden from yourself. I remember you had to point this out to me, and when you described this hidden structure I saw colours floating in between the forms… Sometimes you will only feel a narrative in your subconscious. It’s almost mystical. Especially in an autobiographical sense. Oddný Eir: I think trying to define this new territory is where our common ground is. Not only in transgressing the limits, but also in transforming what is limiting us in loving. There must be a way of being in a relationship and of being in a family. Björk: I totally believe there is a way. Maybe it comes from my punk background, this feeling that you are entering a new frontier, like the pioneer spirit. I always have to have at least one foot going into some territory that hasn’t been mapped out. For my parents’ generation, the way forward for women was out of the family, but I always felt that true feminism was to be able to do both – to have your job and a family. And that would be the true freedom for a woman. When I’m mapping out the cities I tour in, it has to be in flow with the family or for me it’s not right. If you’re just going with what works for your job or your family but not vice versa, then you’re losing as a human being. Oddný Eir: Isn’t it also a question of personal sacrifice in the context of some kind of sustainability? Björk: Yes, it all comes back. It’s interesting how it works because love, out of all things, is probably what makes you most willing to sacrifice. Sometimes people make a sacrifice and they lose a lot from it, and other times it empowers them. In theory it would be amazing if everything was always equal, but I don’t think that’s how human beings function. Sometimes in the short-term you lose, but in the long-term, after some time has passed, you win. Your humility and your sacrifices have become almost saint-like, and it becomes a column of strength. We talk about people of our grandparents’ generation like, ‘Oh they were in a loveless marriage for 50 years and should’ve divorced a long time ago.’ But I think in 30 years’ time we will have many more people living life on their own, like brutal casualties of loneliness. Of course there are unhappy marriages that don’t succeed, but I’m worried about this other development. This century – not only with family and relationships, but also with the environment and with sustainability – you have to think, ‘OK, I’m not the star of the show any more.’ You have to work in a group, as lovers. With the new album, I sat down and was like, ‘Oh my god, I have six heartbreak songs, in chronological order.’ You can never plan those things. But I’d accidentally mapped out the pre- and post-heartbreak. For me as a musicologist – the David Attenborough part in me, if you will – I was like ‘whoa’. I had this document. That was the most interesting part of it all.